Pumpkins have been around for many centuries, referenced and recorded over the years around the world. The name originated from the Greek word ‘pepon’, meaning ‘large melon’, which became ‘pompon’ when it was spoken with a French accent. The English then changed it to ‘pumpion’, and that’s how it was pronounced in Shakespeare’s Merry Wives of Windsor. Finally, the American colonists changed it from ‘pumpion’ to ‘pumpkin’, and that is how we have the spelling and pronunciation today. 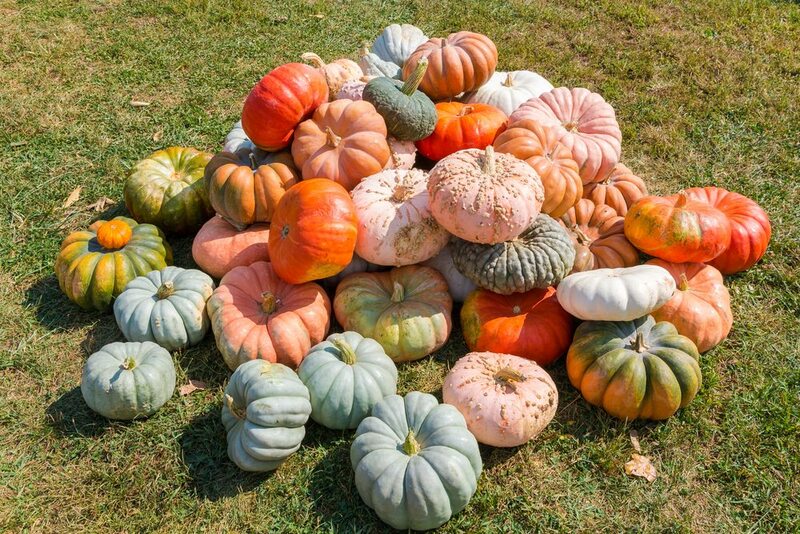 Pumpkins belong to the Gourd Family (Cucurbitaceae) of fruits, which includes melons and squash. They come under the ‘squash’ category of the Gourd Family, and come in different shapes and sizes, with slightly varying tastes. They include Blue Hokkaido, Cheese, Red Kuri, Rouge Vif d’Etampes, Sugar Pie, and White. 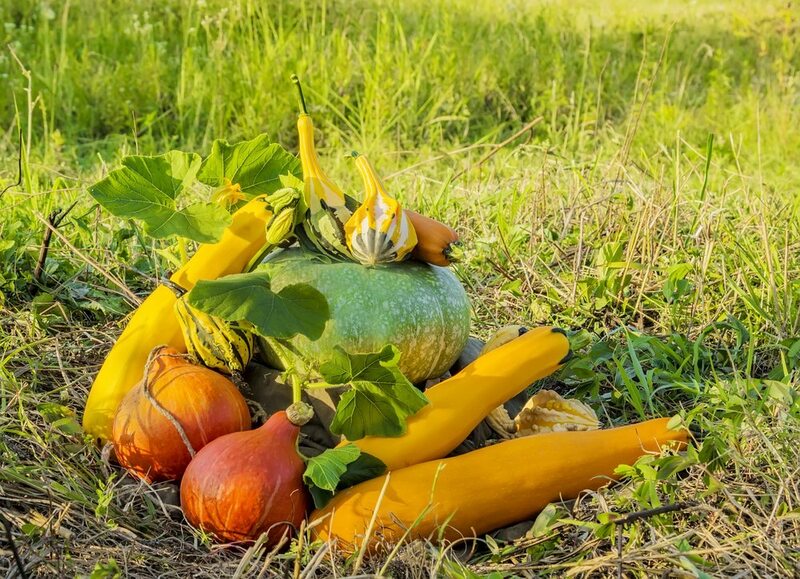 There are also a range of Squash varieties, which come with similar health benefits, and can be substituted in pretty much any pumpkin recipe, including Butternut, Acorn, Delicata, Hubbard, Kabocha, Spaghetti, Sweet Dumpling, and Turban. The large fruit was used throughout history in the US, with Native Americans drying strips of it and weaving them into mats, as well as roasting strips on an open fire and eating them. 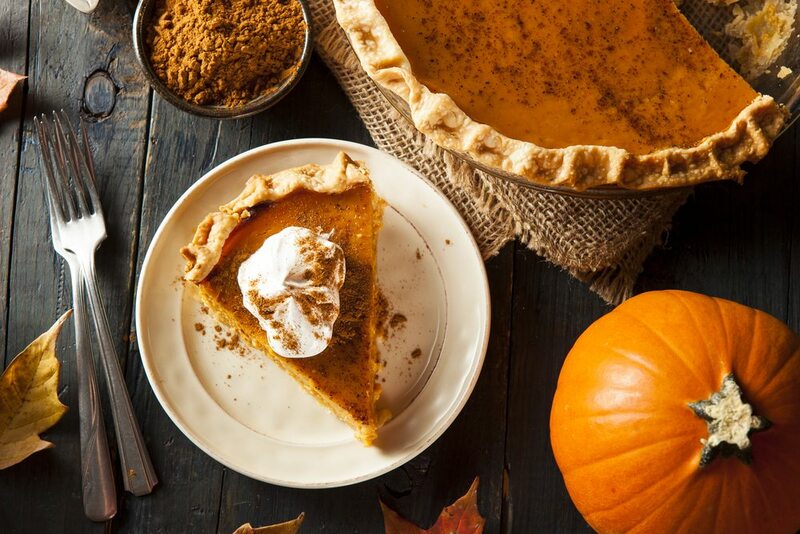 According to records, the pumpkin pie originated from colonists slicing off the pumpkin top, removing the seeds, and filling the insides with milk, honey and spices before baking it in hot ashes. 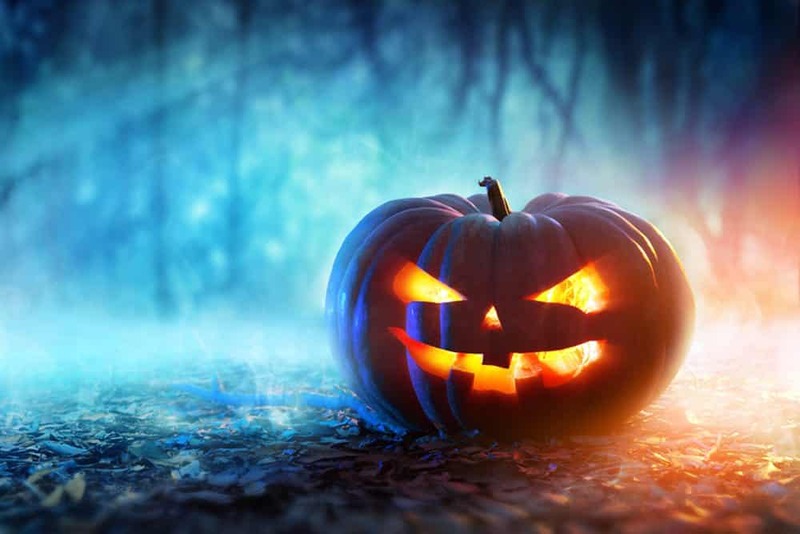 Many people around the world associate Halloween with America, but, in fact, it originated in Ireland some 2,000 years ago. All Hallows’ Eve, or Samhain (the Gaelic word for ‘summer’s end’), was a pre-Christian Celtic festival held around 31st of October/1st of November. The exact nature of the festival is not known for sure, but it was an annual event held at the end of the harvest season before the winter months settled in. People would gather their resources and bring animals back from the pastures. All Hallows’ Eve was also a time to remember the dead, and it is unknown whether these two events intertwined, or which one came first. People believed that during this changeover between summer and winter, or fall and winter as we know it today, the veil between the spirit world and our world was at its thinnest and the two worlds could cross over. They would light bonfires and wear masks so that the ghosts would mistake them for fellow spirits, and they would place bowls of food outside their homes to prevent them from causing any harm or entering their homes. 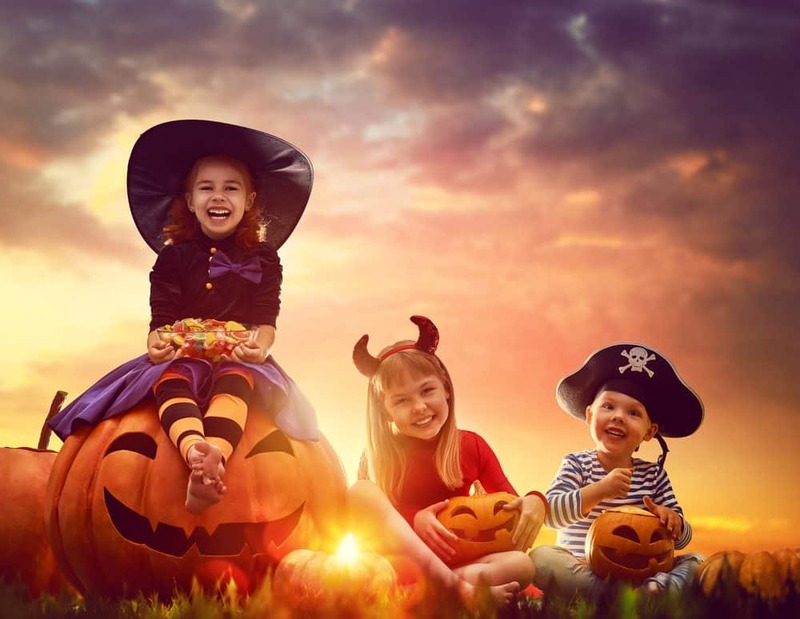 This is thought to be how the tradition of dressing up in costumes and trick-or-treating began. The tradition of carving pumpkins at Halloween into jack-o-lanterns was brought to America by the Irish, and is thought to have originated from an Irish myth about a man nicknamed ‘Stingy Jack’. But pumpkins didn’t exist in Ireland when the ritual started, and they actually used turnips. It was only when it reached America that the turnip was replaced by the pumpkin. Pumpkins are low calorie and high fiber, making them an excellent ingredient when trying to lose weight. 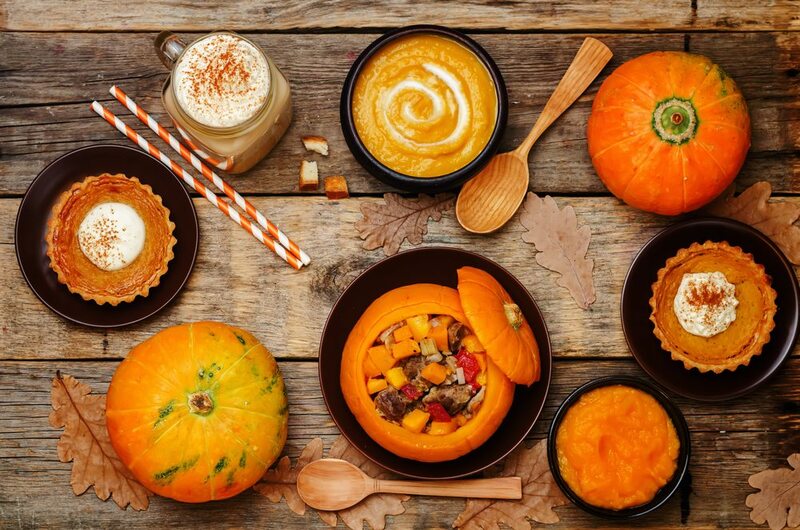 The fiber in pumpkins slows down digestion, keeping you fuller for longer. When boiled in water, or used from a can, pumpkins are nearly 90% water, making them even lower in calories, and keeping you hydrated. 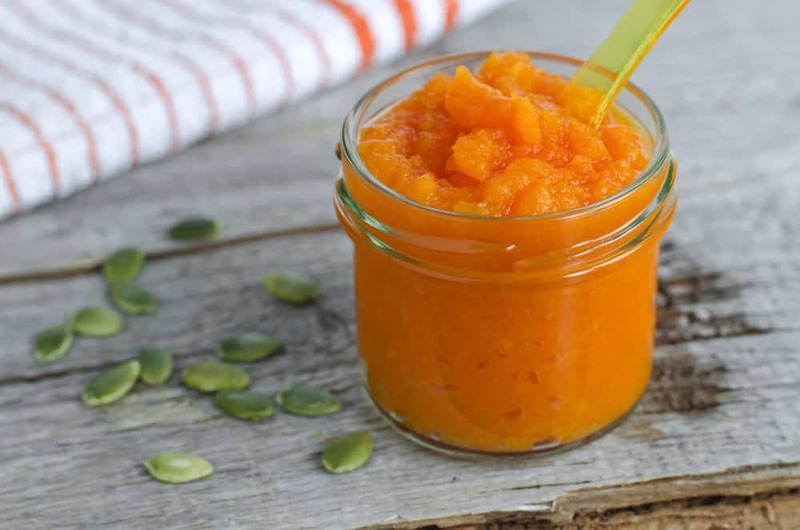 Because of their versatility, pureed pumpkin can be used in desserts, like gluten-free, sugar-free brownies, satisfying your sweet tooth, while minimizing your fat, calorie and sugar intake. They can also help you reduce your grain carbohydrate intake during meals, because they are so filling. The beta-carotene in pumpkin, which turns into vitamin A in the body, is a powerful immune-boosting nutrient. 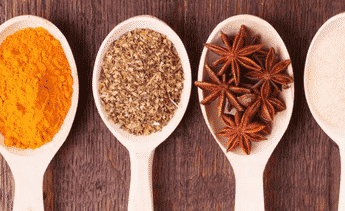 It helps your body fight infections, viruses and infectious diseases. A cup of pumpkin contains nearly 2.5 times your daily need for vitamin A, as well as 19% of the vitamin C you need, which may help fight off colds faster. According to a 2010 study, vitamin A and D play a significant role in supporting a healthy immune system. Pumpkins are also rich in insoluble fiber, which has been found to stimulate the body’s immune system and help fight infection. 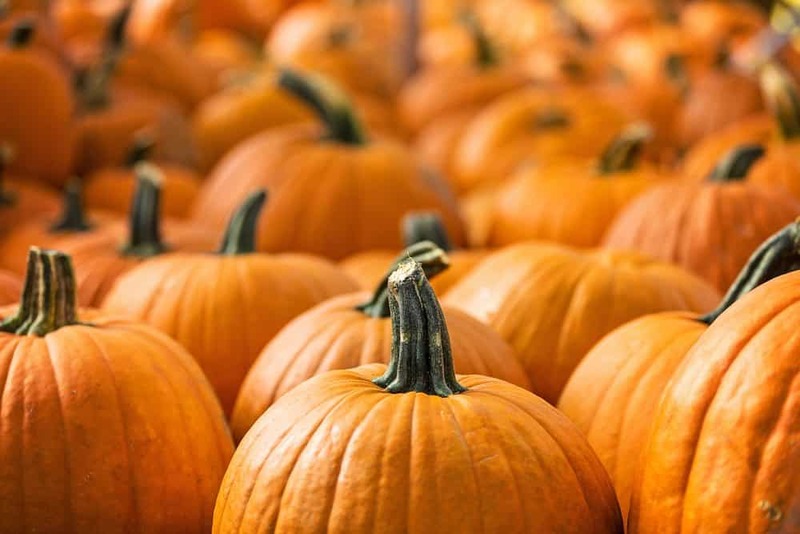 The huge amount of vitamin A in pumpkin comes into play again here, with its better known benefit – eye health. Again, this comes from the beta-carotene, which is converted into vitamin A in the body. This important nutrient helps the eye retina absorb and process light. 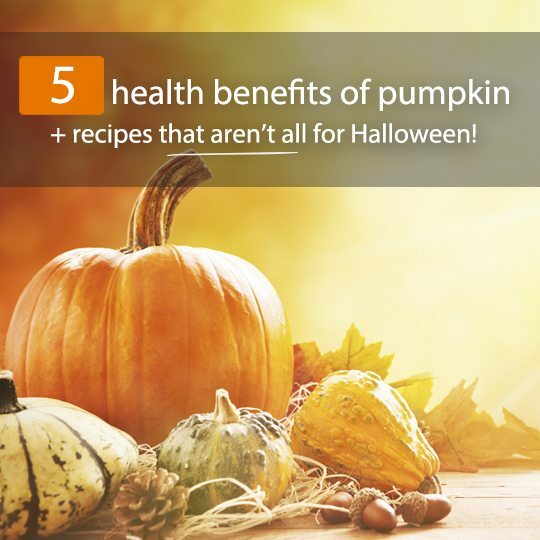 On top of that, pumpkins contain lutein and zeaxanthin, which are powerful antioxidants that may help prevent cataracts and slow down development of macular degeneration. Pumpkin is full of beneficial vitamins and minerals that promote healthy, glowing skin and strong, shiny hair, including B vitamins, vitamin C, E and beta-carotene (to name just a few). Vitamin C helps protect the skin from free radical damage, including wrinkles, and even skin cancer. Consuming foods with vitamin C encourages collagen production, which helps skin tone and elasticity. The beta-carotene in pumpkin can help reverse UV damage and improve skin texture, and the abundant minerals in the orange fruit, including potassium, copper, manganese, zinc, iron and magnesium all play a role in the health and wellbeing of skin and hair, from collagen maintenance and cell membrane protection to healthy hair regrowth and skin cell regrowth. 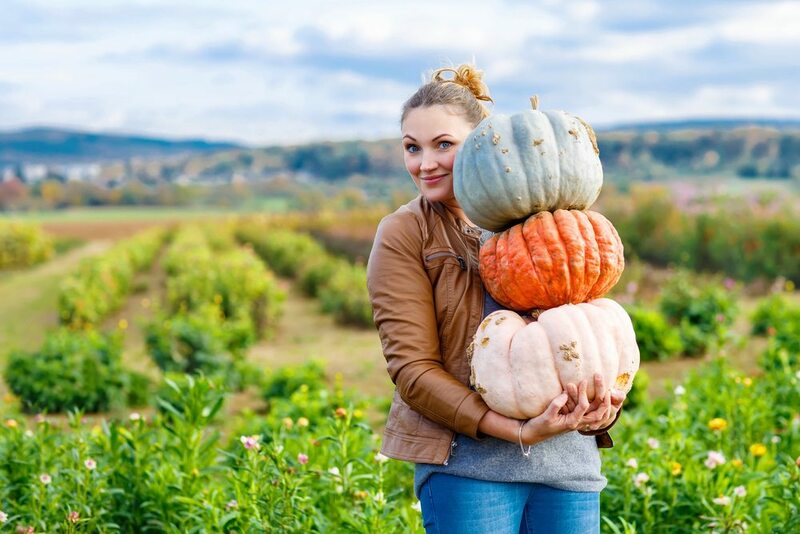 As well as nourishing your hair and skin from the inside out, pumpkin can also be applied topically as a skin or hair mask, and can be used to brighten, soften and moisturize dull or dry skin and hair. Try this DIY face mask using pumpkin, egg, honey and apple cider vinegar or lemon. 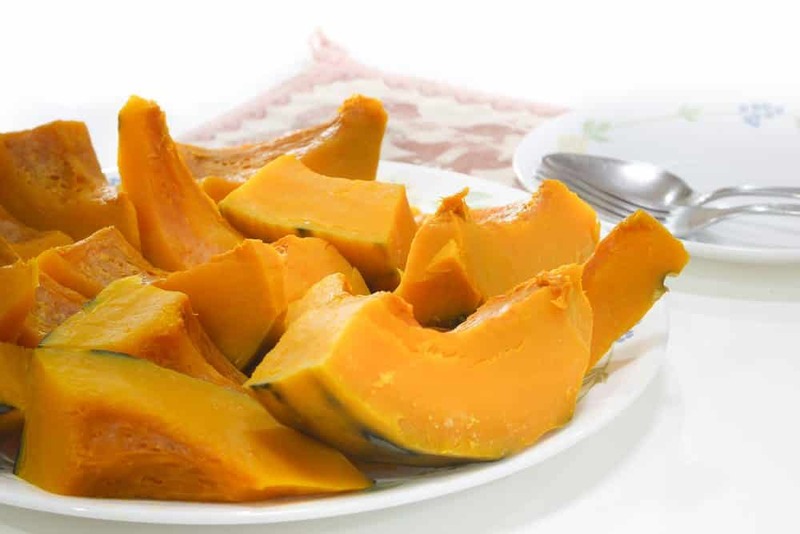 Although pumpkin contains carbohydrates, which can raise blood sugar levels, it also contains a number of nutrients that help minimize the effect on blood sugar, helping to regulate it, making it a good food source for diabetics. Some studies have found pumpkin to reduce blood glucose levels, improve glucose tolerance and increase insulin production. These studies are very much preliminary at this stage, and have only been conducted at laboratory level and on animals, but initial results look promising. Pumpkin Oatmeal Cookies With A Maple Ginger Glaze – These gluten-free cookies are moist with a nice cake-like texture, and are drizzled with a delicious fiery ginger maple glaze. 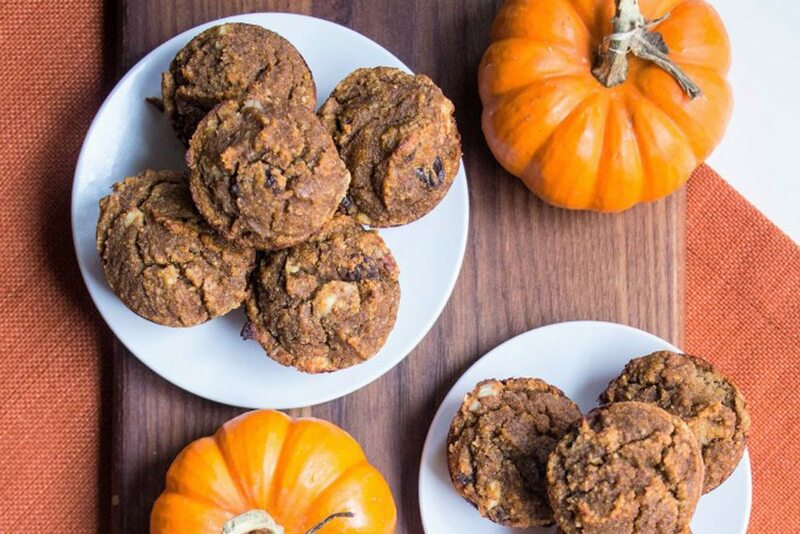 Easy to make, the recipe includes pumpkin puree, molasses, maple syrup, eggs, almond butter, rolled oats, almond flour, baking soda and powder, salt, and pumpkin pie spice. The glaze calls for just two ingredients – grated ginger and maple syrup! Remember to choose gluten-free oats if you have a gluten intolerance, and 100% maple syrup, to ensure there is no added refined sugar. Low-Carb Slated Caramel Pumpkin Smoothie – Healthy enough and filling enough for breakfast, this pumpkin-flavored smoothie is packed full of nutritious vegetables, and is tasty, creamy and rich! 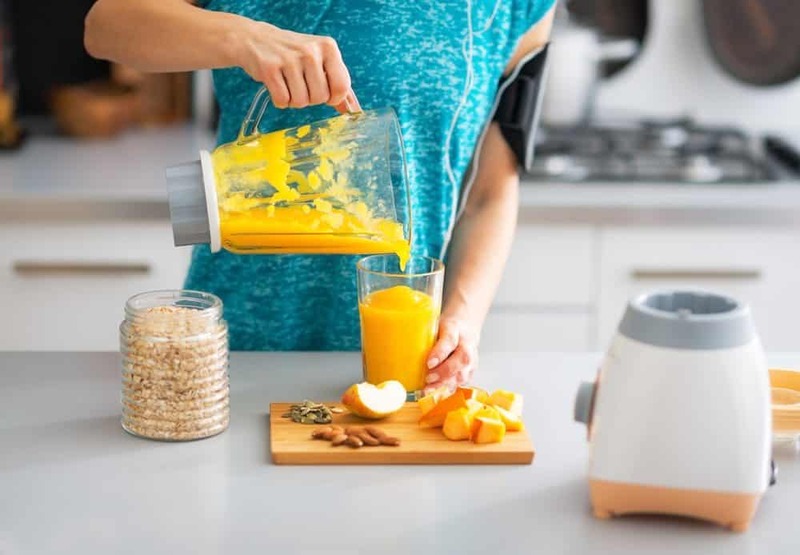 The recipe calls for pumpkin puree, almond milk (go for unsweetened), salted caramel syrup (you can substitute with maple syrup if you can’t find a healthy caramel syrup, or make your own date syrup), protein powder, avocado and ice. 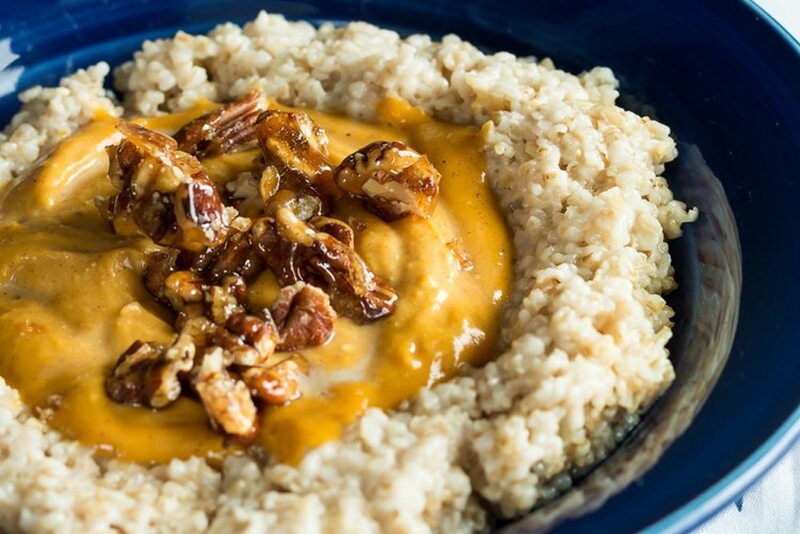 Pumpkin Oatmeal With Caramelized Pecans – Another delicious Autumn-inspired breakfast option is this pumpkin oatmeal. The recipe calls for oatmeal, pumpkin puree, mascarpone cheese, sugar (but you can substitute with maple syrup, honey or stevia if you are going sugar-free), pumpkin pie spice, pecans, salt and milk. Healthy Pumpkin Pancakes – Sticking with the breakfast options, these healthy high-fiber pancakes are a tasty, fun option. They are made with whole wheat flour, baking powder, cinnamon, nutmeg, ground cloves, salt, coconut milk, pumpkin puree, egg, maple syrup or honey, vanilla and coconut oil. Almond Coconut Pumpkin Muffins – These super healthy paleo-friendly muffins are full of flavor and nutritious ingredients. The recipe calls for ground almonds, baking powder, cinnamon, ground cloves, nutmeg, salt, walnuts, raisins or tart cherries, pumpkin puree, eggs, almond milk, maple syrup or honey and vanilla extract. Pumpkin And Dukkah Salad – Moving onto something a bit more savory, this delicious lunch or dinner option, or side dish option will nourish your body from the inside out! It is made with cubed pumpkin, baby spinach leaves, cheese, cherry tomatoes, Dukkah and pine nuts. It also comes with a DIY dressing option, which is made with olive oil, wholegrain mustard and balsamic vinegar. 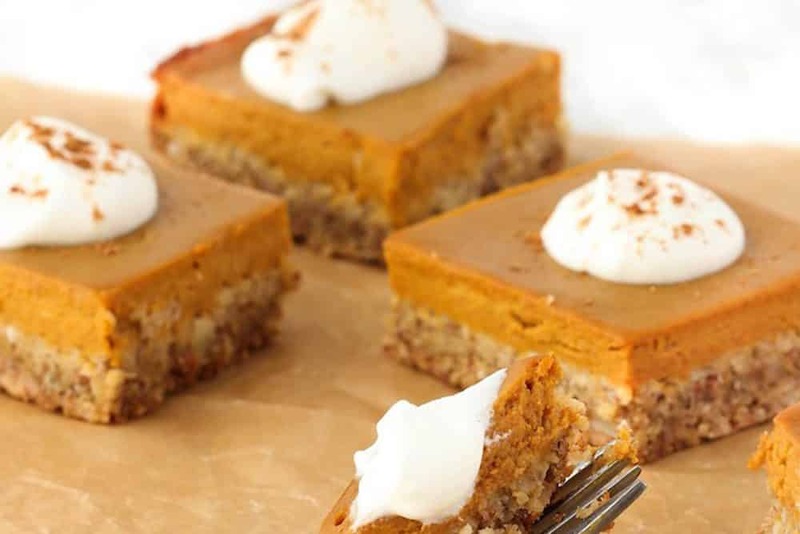 Hearty Pumpkin Pie Bars – This healthy twist on the traditional pumpkin pie uses natural whole foods and is gluten-free! It is made with oats, almonds, salt, coconut sugar, butter, pumpkin pie spice, milk, eggs and pumpkin puree. Flourless Pumpkin Brownies – This lesser-known ultra-healthy protein-packed brownie option is similar to the popular sweet potato brownie. It uses just four ingredients for the brownie and four ingredients for the frosting. The brownie batter calls for pumpkin puree, smooth almond or cashew butter, cocoa powder (unsweetened), and protein powder, and the frosting calls for chocolate protein powder, granulated sweetener (like stevia powder), nut butter (cashew or macadamia works well because they’re nice and smooth), and vegan milk of choice. 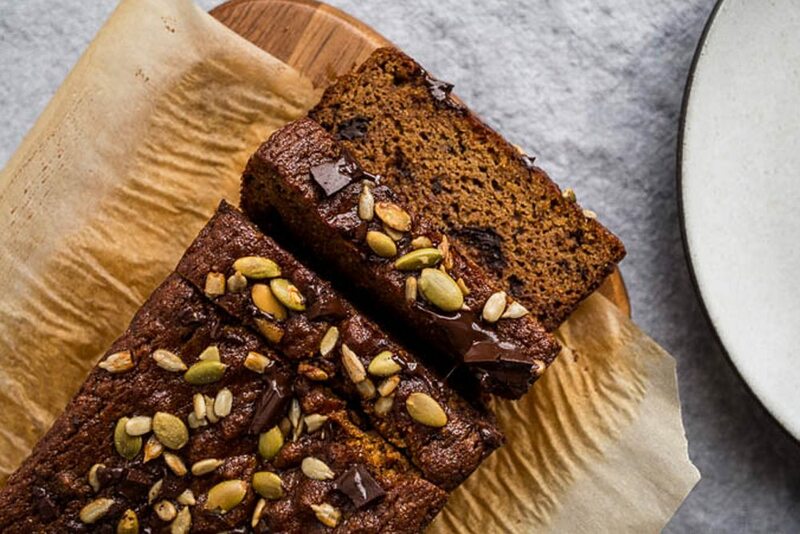 Pumpkin Bread – This easy gluten-free pumpkin bread is made with pumpkin puree, honey or maple syrup, almond flour, cinnamon, ginger, cloves, salt, baking soda, eggs, vanilla extract, bittersweet chocolate chunks, and pepitas. It is healthy, hearty and full of essential nutrients, including fiber, vitamins and minerals. Pumpkin Squash Ginger Spiced Soup – Another savory option on the menu, and this time a great option for winter. This warming, thick, spiced soup is made with roasted pumpkin, roasted squash, baked sweet potato, cumin, fennel, ginger, olive oil, onion, and chicken or vegetable stock. 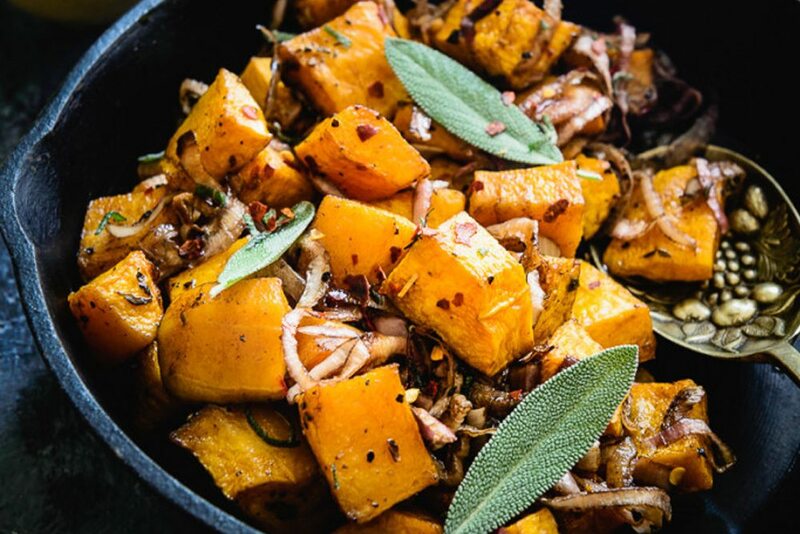 Rosemary & Balsamic Glazed Pumpkin – This delicious vegetable side dish, or roasted salad is full of wholesome ingredients, essential nutrients and delicious flavors. The recipe calls for pumpkin, red onion, rosemary, extra virgin olive oil, balsamic vinegar, salt and pepper. Healthier Pumpkin Pie – And we couldn’t finish this blog post without including a pumpkin pie recipe! This healthier version calls for raw pecans, maple syrup, coconut oil, whole wheat pastry flour and salt for the base, and brown sugar, salt, cornstarch or arrowroot, nutmeg, cinnamon, cloves, ginger, pumpkin puree, vanilla extract, eggs and coconut milk for the filling.